Dubai has one of the most recognisable skylines in the world thanks to its groundbreaking architecture. It boasts the world’s tallest building - the Burj Khalifa – as well as the Burj Al Arab hotel, the sail inspired structure that’s home to the self-coined, first-ever, seven-star hotel. Some of the world’s best architects have been drawn to Dubai for decades, shaping the landscape that has become the city we see today. They include someone at the very top of their game - Danish-born architect Janus Rostock, the man behind the Dubai opera house. Work began on the opera house building in 2013 and took three years to complete. Rostock says one of the best aspects of his job is creating a building that gradually adapts to its environment. But he admits creating the building came with a daunting set of demands. Design-wise, Rostock wanted to create a building shaped like a dhow, the traditional sailing boat of the region. As Rostock explains, the vessel has its roots in the very city itself. Rostock says he was interested in working in Dubai as he believes it provides fertile ground for the imagination. “I think Dubai is interesting in the sense that it's a playground, it's a sandbox for many architects,” he says. Architecture was in Janus Rostock’s blood from an early age. He wanted to become an architect when he was just 8-years-old following in the footsteps of his grandfather who was the head of an architectural practice. He was drawn to working in Dubai on the opera house project because in many ways it was like working on a blank canvas. Rostock firmly believes the best architecture is the product of team work with talented, creative people coming together. “I can only do what I do because I'm working with brilliant people,” he says. “So for me, I'm saying ‘the star architect is dead’. Rostock happily describes Dubai as a melting pot. So how easy was it to make the transition from working in Europe to the Middle East? “It was in 2005, and Dubai was different to what it is today. It was a mega-construction site, so there were cranes everywhere, lots of dust, and in that sense a little more like the Wild West,” he says. “Today what you're seeing is a toned down version of what Dubai was when we came here. That being said, it was still a place that attracted us. Really nice people, very, very interesting projects and amazing opportunities for an architect to test the skills that we've learned back in Europe." Dubai harbor, Al Kifaf centre, Bluewaters island and Dubai Creek harbour are just some of the other standout projects Rostock has been involved in. 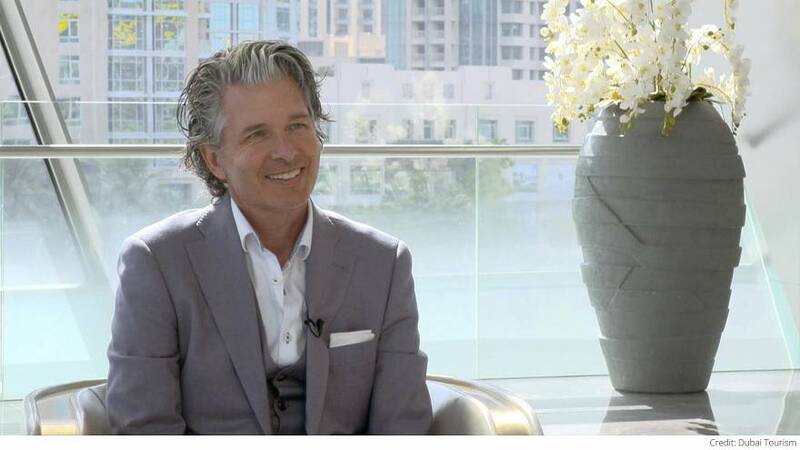 And he feels all of these have fundamentally changed the face of Dubai, just as new projects will continue to change the face of the city in the future. But, for Rostock, Dubai is not 'all work and no play'.